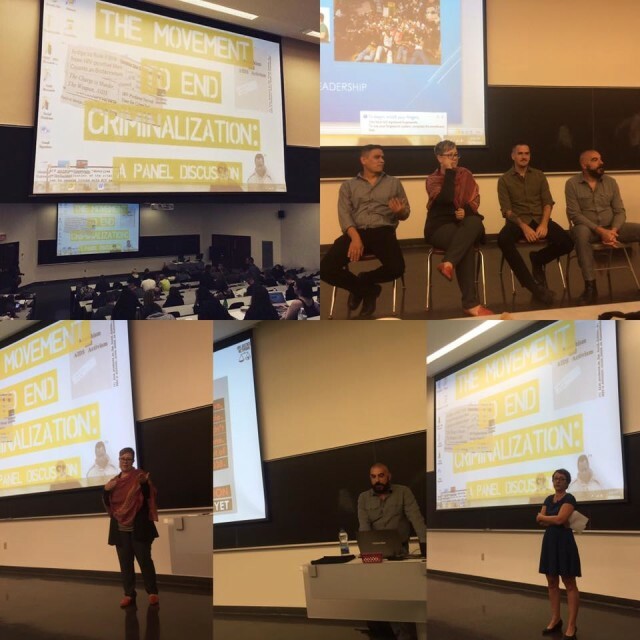 Last week, Concordia Unversity in Montreal, Canada, held the world premiere public screening of HJN’s ‘HIV is not a crime training academy’ documentary, followed by three powerful and richly evocative presentations by activist and PhD candidate, Alex McClelland; HJN’s Research Fellow in HIV, Gender, and Justice, Laurel Sprague; and activist and Hofstra University Professor, Andrew Spieldenner. The meeting, introduced by Liz Lacharpagne of COCQ-SIDA and by Martin French of Concordia University – who put the lecture series together – was extremely well-attended, and resulted in a well-written and researched article by student jounrnalist, Ocean DeRouchie, alongside a strong editorial from Concordia’s newspaper, The Link. Receiving an HIV-positive diagnosis is already a life sentence. The state of Canada’s legal system threatens to give those living with the virus another one. An HIV diagnosis is accompanied by its own set of complexities that are not encompassed in Canada’s criminal law. By pushing HIV non-disclosure cases into the same box as more easily defined assault cases, we are generalizing an issue that frankly cannot be simplified. This does not reflect the reality that one faces when living with HIV. Criminalizing the virus further stigmatizes what should and could be everyday activities. This puts the estimated 75,000 Canadians living with HIV at risk of being further isolated. This takes us backwards, considering the scientific progress that has been made to make living with the virus manageable. Under the proper antiviral medication, one’s risk of transmitting the disease is incredibly low. This stigma is rooted in an antiquated understanding of what HIV is and the associated risks—much of that fear having emerged primarily as a result of homophobia. Further, with over 185 cases having been brought to court, Canada is leading in terms of criminalizing HIV non-disclosure. This pushes marginalized communities farther away. According to estimates from 2014, indigenous populations have a 2.7 higher incidence rate than the non-indigenous Canadian average. Gay men have an incidence rate that is 131 times higher than the rest of the male population in Canada. As of Sept. 19, doctors in Saskatchewan are calling on the provincial government to declare a public health state of emergency, with a spike in HIV/AIDS cases around the province. In 2010, it’s reported that indigenous people accounted for 73 per cent of all new cases in the province. Outreach and treatment for these communities are at the forefront of Saskatchewan’s doctor’s recommendations for the government. With such a highly treatable virus, however, the problem should never have gone this far. It is an excerpt from a much bigger issue. As we can see from the available statistics, HIV—both the virus and its criminalization—is a mirror for broader inequalities that exist within society. HIV related issues disproportionately affect racialized people, gender non-conforming people, and other marginalized groups. Discussions around HIV also must include discussions around drug use. The heavy criminalization of injection drugs has created a context where users are driven deep underground, thus putting them at an incredibly high risk for contracting the virus. Treating drug use as a health rather than a criminal issue is an integral part of any effective HIV prevention strategy. Safe injection sites, such as Vancouver’s InSite, have made staggering differences in their communities and prove to be a positive way of combating the spread of HIV. This is just one of the many ways that we can control the spread of HIV without judicial intervention, without turning the HIV-positive population into criminals. Using community-based research enables us to not only understand the needs of the affected population—particularly when it comes to understanding the almost inherent intersectionality associated with the spread of HIV—but also allows us to better target our resources towards those who need it most. Often times, that stretches to include those closest to HIV-positive individuals. Spreading awareness, and developing resources and a support network for them is just as important in fighting the stigmatization of the virus. The Link stands for the immediate decriminalization of HIV non-disclosure, and the move towards restorative justice systems in non-disclosure cases. As always, those directly affected by an issue are the ones with who are best positioned to create a solution—something that the restorative justice framework embraces. The disclosure of one’s HIV status is important. Jailing those who don’t disclose it, however, won’t make the virus go away. It simply isolates the problem, places it out of site and out of mind. Criminalizing HIV patients is less about justice than it is about appeasing the baseless fears of the general population. It’s time for a more effective solution.